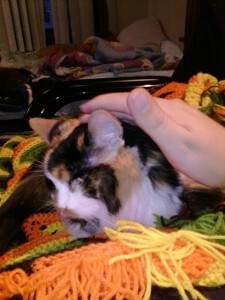 Our dear companion of the past five years has passed in her sleep last night. We don’t know where Lady originally came from. The story was that she was adopted as a kitten by an elderly woman. When that women died, Lady went to another elderly woman, who also did not have long to live. 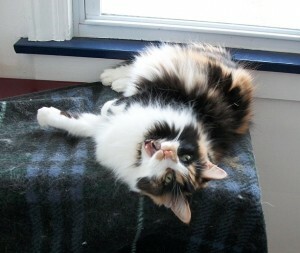 When we first met Lady at the shelter, she was nine years old and seemed depressed and disillusioned with abandonment. She spent most of her time motionless, far in the back of her cage, facing away from the entrance. Few people adopt older cats, and the employees may have felt that Lady might never leave the shelter again. When my partner, FO, visited the shelter around that time, she tried cheering Lady up with catnip. The effect was profound! Lady would leave her cage and bat at the catnip toy, wiggling after it! 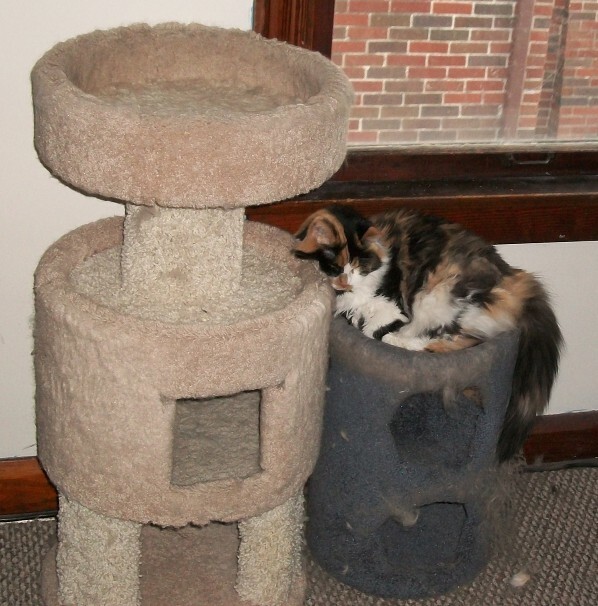 When we moved from our rented townhouse to our own home that year, FO adopted Lady. Lady moved in before we did, and had the house to herself for a while. 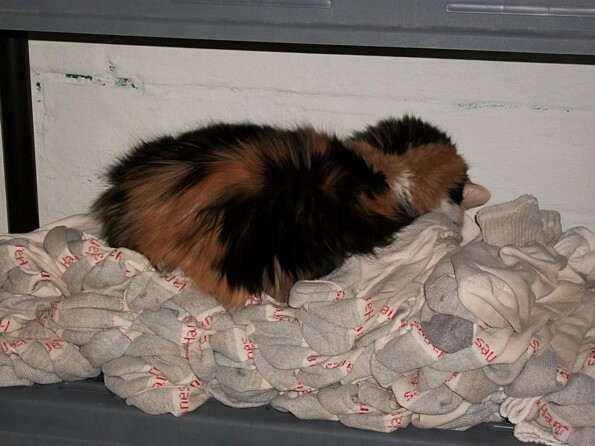 Once, after we moved our sleeping bags there, we couldn’t find Lady anywhere. Then I noticed a sleeping bag had started to twitch. She was hiding under it. Once we were storing our socks on some shelves in the basement. A great Lady moment was when she climbed on the pile and used it as a bed. 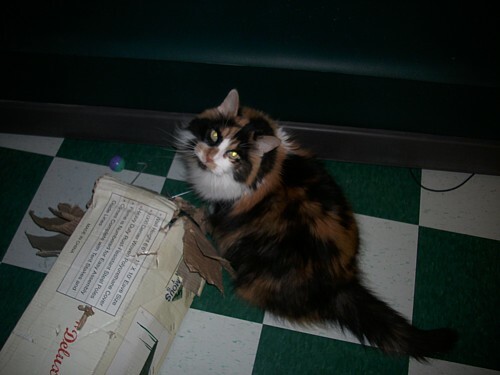 Lady continued her habit, from the catnip at the shelter, of getting high on things. One of the most distinctly Lady things she did was get high from the smell of new screwdrivers. 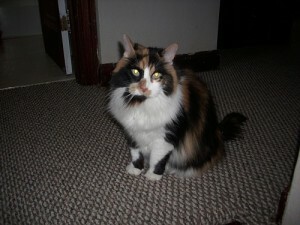 Unfortunately, we had several cats even before we adopted Lady, and a few more from the neighborhood moved in. Different cats seem to have different degrees of identifying as a cat or a person. One of our cats, Miss Tabby Saddle, was a stray for over a year, and in that time gave birth to her own kittens. We only took her in after she broke her arm, to save her life. 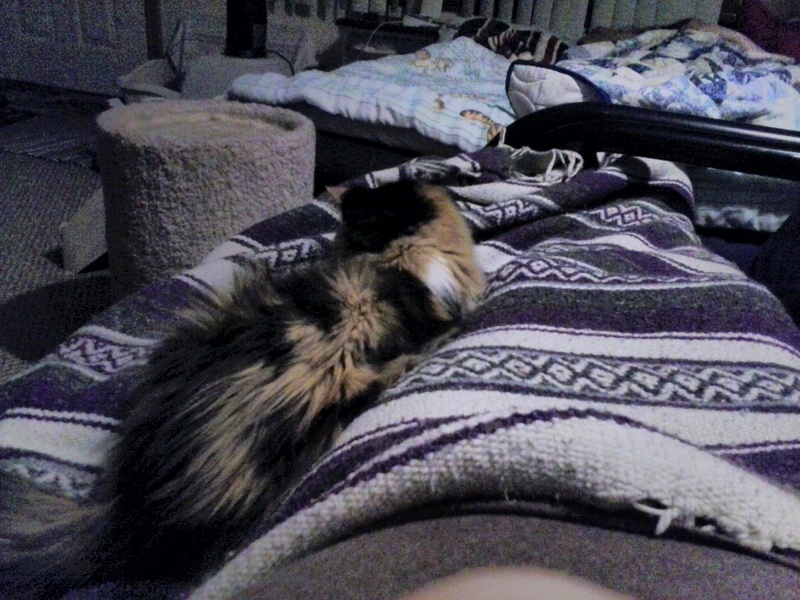 She still seems to identify purely as a cat, and wants to make friends with other cats, but is scared of FO and me. Lady, on the other hand, who had lived with other people for most of her life, seemed to identify more with us, and was not fond of the other cats. 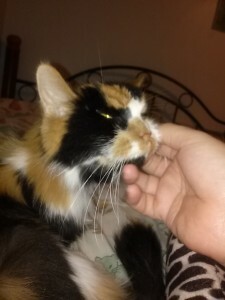 There were times when her depression returned, which may have been due to having to share the house with other cats, or may have been due to health issues we were not yet aware of. I eventually decided I would have to take steps to help with her depression, and break through her shell. She had been living alone in a bedroom upstairs. I did not think that was good for her, so one night I grabbed her. She screamed and protested. 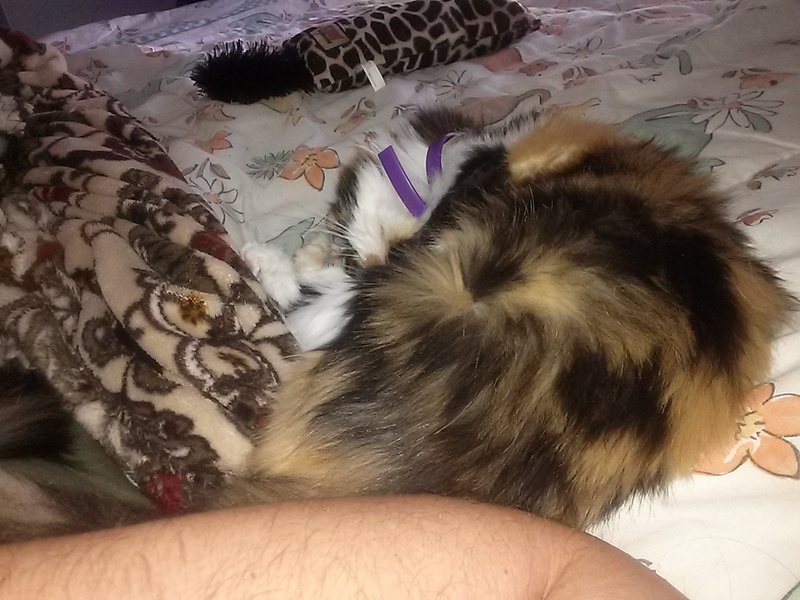 I carried her into the master bedroom, sat down, set her down by me, and did some reading with her nearby. She, with a genius level of empathy, with no words exchanged, immediately knew what I was doing: That I brought her with me because I loved her and wanted to be with her. After that one night, Lady knew that I loved her, and on her own would seek me out. I could be sitting anywhere in the house — it no longer needed to be upstairs — and she would jump up on my lap and cuddle with me. When I went to sleep, she would cuddle into my chest. This went on for months. These were some of our happiest moments together. Although Lady had a grumpy side, it only seemed to make her sweeter when she was loving. I know I have some rough edges myself, and this commonality between us only strengthened our bond. One night, I noticed that Lady had a line of blood horizontally across one of her major fangs. It seemed to be an emergency, so we took her to a 24-hour veterinarian. They said that several of her teeth would need to be pulled. Around this time, her hair was becoming dense with hard mats and hair knots. 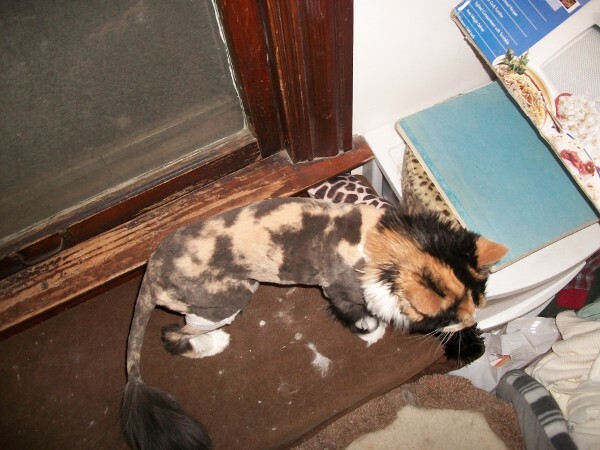 We asked if she could be shaved while she was under. We had not realized until then, because she was a long hair and that had disguised it, that she had lost a frightening amount of weight. We had another older cat, Pepper, who was losing weight. A veterinarian discovered that she had a hyperactive thyroid. She had other issues as well, such as Inflammatory Bowel Disease (IBD), a harsher version of the more common Irritable Bowel Syndrome (IBS). This meant that she harshly rejected the liquid Methimazole treatment intended to control her T4 levels. We switched to an ear paste, which she also harshly rejected; she lost hair on her ears and her face swelled. Moreover, it was doubtful she was even absorbing the methimazole. However, when we switched to simple pills (as in the same methimazole pills a human would take), she began to recover. She also had some subcutaneous B12 injections. On this treatment, she recovered from her low weight of less than 5.5 pounds to above 7 pounds (which is the proper weight for her frame). We tried having Lady tested for these same issues, in the hope that a similar recovery was possible. There was, however, no indication that her thyroid was overactive. Instead, there were signs that her kidneys were failing. We switched her to renal diet food, but unfortunately she was not fond of the flavor, and would poach Pepper’s leftover wetfood whenever possible. Once, after this, when we had some work done on the house, the contractors must have left the back door unlocked, and it blew open during a storm with high winds. Of our cats, Cheddar, Pepper, and Lady had gone out the door and outside. I only noticed this when I woke up at 5 am to use the bathroom. Fortunately, we were able to recover all of them. Lady and Cheddar were in the backyard, near the door. In the past, whenever Lady had gone outside, she had gotten overwhelmed and froze up, and this helped us that night, as she had no urge to run. She was frightened, though, and had a fit when FO picked her up and carried her back in the house. She survived for over a year after her initial kidney diagnosis, but then her issues became chronic and her weight loss continued. I pleaded with the vets for some course of action, and when they assured me that they were doing everything, medically, that they could (recently, after such pleading, we starting giving her subcutaneous fluids), I began to think about what could be done to make her final moments as happy as possible. FO and I at least had to consider euthanasia, but we decided that if she was not in bad pain, and if it was at all possible for her to die in her sleep in her home, rather than at the vet, which she doesn’t like, we should give her that option. The vet told us that the typical discomfort associated with kidney disease is not pain, per se, but we did get some pain killers. 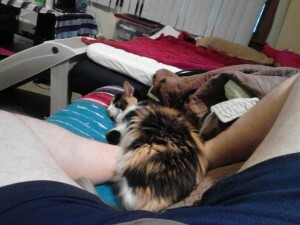 Some nights the previous week I had slept with her, and she cuddled into me as she had been for the past several years. She began to lose control of her bladder, as well as her coordination. 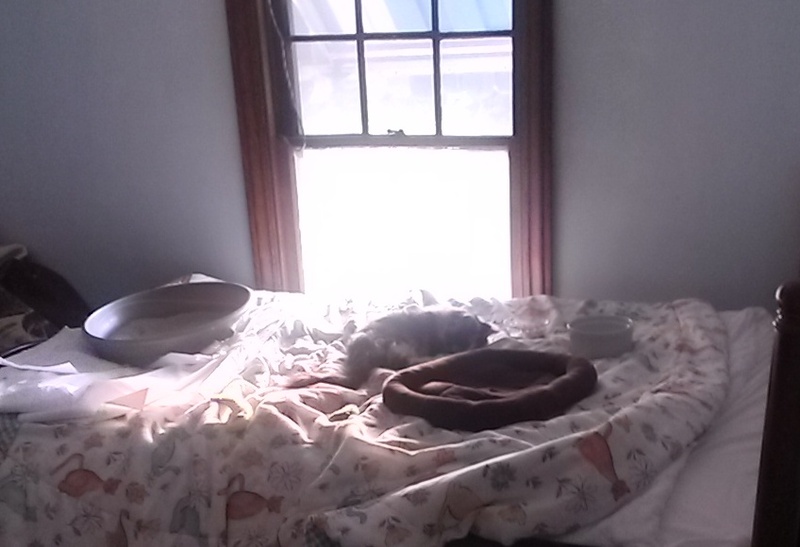 To make things as easy for her as I could, I put a litter box, water and food, and her own cat bed on the bed. 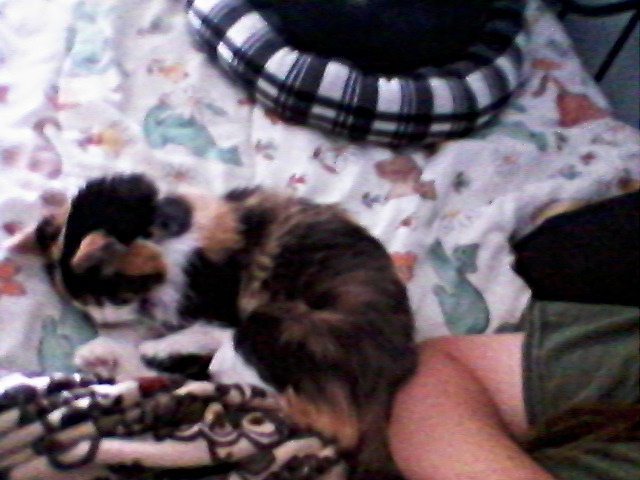 The downside was, with this much stuff on the bed, I found it difficult to sleep with her as much. Sunday morning, I woke up early, before FO, and managed to fit myself onto the bed with Lady, and cuddled with her more. Later that night, I began to wonder if it would be better for Lady to be on her own, or with the family. At the time, she was in her final sunny spot. I let her stay there. After the sun set, I decided to take her downstairs to be with the family. We had a pen set up for her. 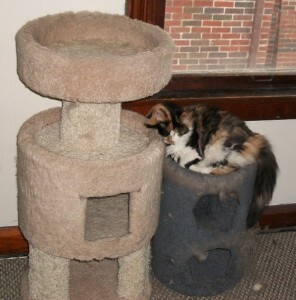 Since one of her favorite things was catnip, we bought a brand new cosmic catnip banana and put it with her. And so I could be as close to her as possible, I slept on the floor next to her in a sleeping bag. When we woke in the morning, she had passed on. My hope is that, by adopting her from the shelter, we were able to give her more freedom and more of a family than she would have otherwise had. My other hope is that at the end she knew she was with people who loved her. In her time with us, she had given me affection and unconditional love, and was a source of endless joy. (FO became interesting in adopting Lady in this original thread. This was the post in which FO discovered Lady’s love for catnip. This entry was posted in cats and tagged Lady by admin. Bookmark the permalink. My condolences to you and FO, I’ve never owned a pet but I know the loss of any family member is hard.